The media's Trump Derangement Syndrome is contagious and they continue to deliberately spread it throughout the "Resistance" movement. After documenting the dozens of examples of media malpractice, lies, outright fake news, misleading headlines, retractions, deletions, corrections and apologies, over the past couple of years, I still find myself shaking my head in disgust when browsing through the news online and see a series of examples that prove Trump Derangement Syndrome has gotten even worse among those that consider themselves the media elite. In their never-ending rush to mislead, or to find something, anything to insult or degrade President Trump, multiple journalists rushed to Twitter to "inform" their followers/readers that President Trump told Finnish President Sauli Niinistö "I enjoyed being with you a couple of days ago. NATO has, I think, never been stronger. It was a little bit tough at the beginning, but it turned out to be love. I appreciated your support." Had they all stopped right there, they would have reported something that actually happened, but they didn't stop there. 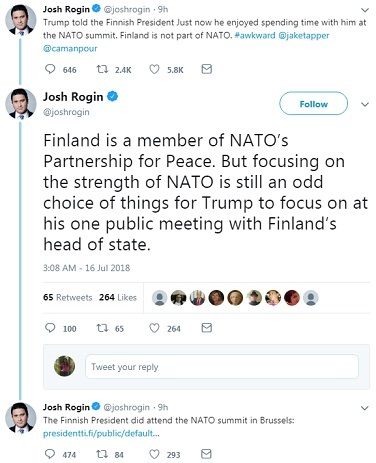 Each of these so-called reporters, which includes Henry Foy from Financial Times, Josh Rogin, a Washington Post analyst and CNN commentator, Julie Davis, a NYT writer and CNN analyst, and Sebastian Fischer from Speigel Online, all informed their followers that Finland is not in NATO, with Rogin even using the hashtag #awkward to imply that President Trump screwed up and Niinistö wasn't at the NATO Summit. Julie Davis from New York Times was even more snarky, asking "Does he think Finland is in NATO?" 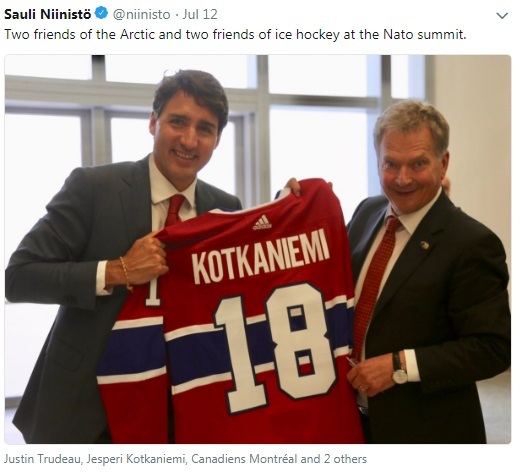 Rather than rushing to drag the president, had any of them simply done even ten seconds of research, (like going to Finnish President Sauli Niinistö's Twitter page), they would have known that while he is not a member of NATO, he was at the NATO summit, and had posted images during the event. 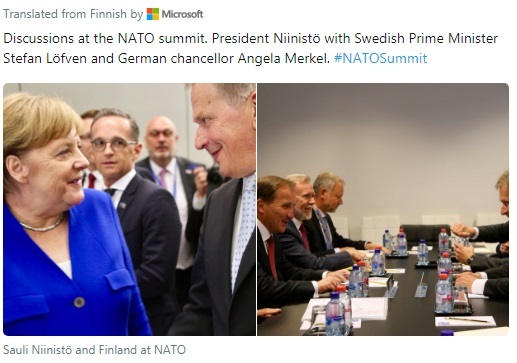 Not bad enough these "journalists" couldn't be bothered to find out that the Finnish president was at the NATO summit, but between them all they had their very misleading "news" retweeted more than 8,000 times, with over 19,000 likes. Each of the 8,000+ retweets then went out to all the followers of those that shared the Fake News. Comments in their original tweets call Trump clueless, saying President Trump doesn't share the same reality, calling him "colossally stupid," and on and on it goes. So they misinform their readers, then those readers go out and spread the same misinformation to their followers, and now because those media personalities are so sick with Trump Derangement Syndrome, they have managed to mislead thousands and thousands of Americans. Granted, there are some in those comments trying to correct the record, offer the facts and proof that the reporters got it wrong, but those are barely acknowledged. In a subsequent tweet Rogin did acknowledge "The Finnish President did attend the NATO summit in Brussels." That was offered just two minutes after the initial tweet which stated "Trump told the Finnish President Just now he enjoyed spending time with him at the NATO summit. Finland is not part of NATO. #awkward @jaketapper @camanpour." While his original tweet, two minutes before, had garnered 2.4K retweets, his correction only garnered 84 retweets. 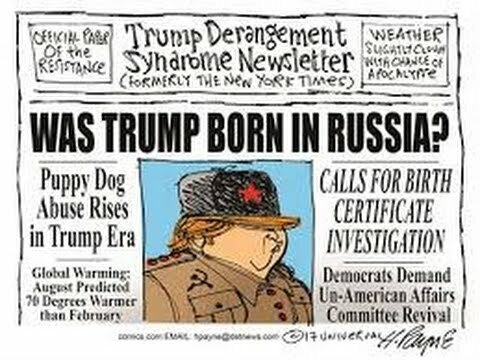 Their TDS is highly contagious and the fact that it spreads so quickly with every misleading story or message, shows why Trump Derangement Syndrome has become an epidemic at this point throughout the "Resistance." Moving along because different media outlets have been very busy as well. Huffington Post provides an example of exactly what "journalism" has become today. Not only is that what they chose to use as a promotion for an article, the quote was taken directly from the article itself. Some even thought it was a parody or satire, but it wasn't. HuffPo truly thought it was "news." Then we look to the New York Times opinion page, where their Trump Derangement Syndrome has gone so far over the line, they have managed to annoy liberals and conservatives and pretty much everyone in between. That takes talent! 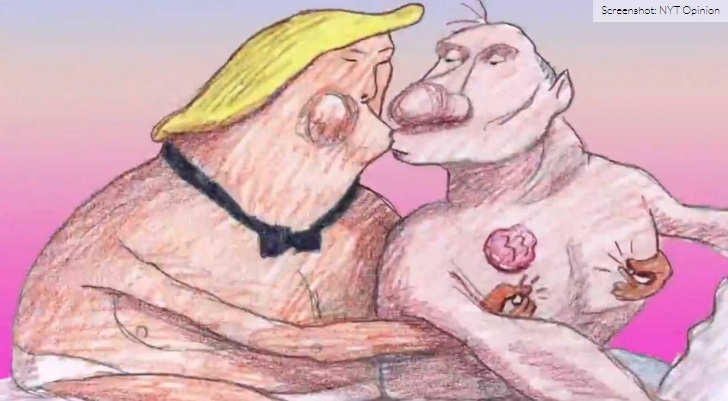 They shared a 1:12 second video titled "Trump and Putin: A Love Story," which depicted homosexual relations between the two leaders, with the message in their promotion stating "In this episode of Trump Bites, Donald Trump’s not-so-secret admiration for Vladimir Putin plays out in a teenager’s bedroom, where the fantasies of this forbidden romance come to life." Their Twitter thread from this post is a hot mess, conservatives and far left liberals are shredding them. CNN commentator Symone Sanders tells NYT "This is homophobic." When you have people from CNN criticizing the nature of your insults against President Trump, you know you jumped the shark. The clip is below, but FAIR WARNING, it is pretty offensive. Brian Sims, Democratic member of the Pennsylvania House of Representatives and LGBT activist, agrees with Sanders, stating "@nytimes this isn’t just intensely stupid it’s homophobic as all hell. What on Earth makes you think that equating the love that millions of people across the planet feel for one another to the unconscionably criminal relationship between these two is OK?!? Truly, please explain." Another user that calls himself a "snarkish homosexual," piles on the NYT, stating "This annoys me so damn much. So many people who say how much they love LGBT people but think this is hilarious." That is just a small sample from liberals and LGBT activists, but the entire thread is full of criticisms from the left, the right, and the center. One specific comment on that thread pretty much captures the theme of the rest of them, as well as this article, when user Lady Stevie says "MSM dies in Broad Daylight." MSM: THE OPPOSITION PARTY OR ACTIVISTS? We have documented multiple instances where so-called reporters have carried on at press conference, shouting out at inappropriate times, disrespecting their own colleagues who were tagged to ask a question, and basically grandstanding and making themselves the story instead of reporting the news, and it happened again on Monday. The Nation's Op-Ed reporter, Sam Husseini, had to be forcibly removed from the press briefing room by Finnish officials, before President Trump and Russian leader Vladimir Putin, appeared to take questions. Husseini was reportedly holding up a sign that said "Nuclear Weapon Ban Treaty," when an official tried to take the sign, which led to a scuffle before multiple officials joined in to forcibly remove him. Of course there is video of it. Today's outrage by the perpetually outraged with Trump Derangement Syndrome, is the Trump/Putin meeting and press conference, but that isn't really news because everyone knew they would squeal in horror before the meeting even took place. The bottom line here is that the media these days are too far gone, the TDS has infected at least 90 percent of what is generally called the mainstream media, who in turn, is busy spreading the disease to the #Resistance. They are not reporters, nor journalists, they have become the opposition party, the propaganda arm of the Democrats, and their TDS has reached epidemic proportions.